Many of you responded to an earlier wisbit about how we might Drop or Ignore . . . Criticism. I’m still working on that! “Who is this one condemning me,” I ask, “when set beside that One who does not condemn me?” I think I shall not be depressed about this condemnation of me, then, especially since I know that “nothing can separate me from the eternal love of Christ” (Rom. 8:33–35). And in this context it seems only intelligent just to have done with the whole condemning game. I want to be done with the whole condemning game, but I’ve puzzled over how not to receive the criticism in the first place. It gets handed to you, sometimes thrown in your face. I’ve pictured myself with a Teflon exterior – nothing sticks to me, nothing nicks me, I’m easily cleaned off. That goes with the verse, “Nothing shall offend thee” (Ps 119:165, KJV). Nothing offends me, but not because I’m a wimp, but because I refuse to receive the criticism by taking it in and turning it over in my mind. I want a Teflon, unoffendable way of being in the world. This verse is also translated/paraphrased as: “Nothing trips us up,” or “Nothing causes us to stumble.” Stumbling occurs when we receive the criticism and slip into counter-condemnation: “But you are the one who . . .” “But you said this about . . .” So the solution really is not to receive the criticism when someone puts it right there in front of us. But how? A new image came to me recently that is helping me do this. 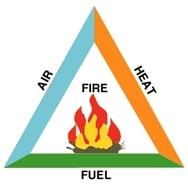 I thought about the ingredients needed for a fire: air, heat, fuel. The fuel is the criticism laid in front of us. And it’s generally laid there with some heat. Normally, we feel that heat! If we receive the criticism/condemnation (think about it, go over it, even dwell on it, talk about it with people), we give it air, or “air-time.” And some of that air we give it has a lot of heat! And we are burned from the flames of this criticism. What if I don’t give the fuel (criticism) air-time? To drop it or ignore it is to withdraw a key element required for a fire: air. Even if the other person gives it air-time in their minds, I don’t have to. More than likely, they haven’t thought of it again – while I have not forgotten it. This is a key to having an offendable, Teflon-quality self, which then in turn, frees me to have a right heart–to love God and whomever is standing in front of me at that moment. If you wish to comment, please do so on the Conversations blog. You are receiving this email because you are on our mailing list. If you would like to unsubscribe, please visit http://www.janjohnson.org/wisbits.html or reply with UNSUBSCRIBE in the subject line.